We would rather see you have more time to lounge alongside our crystal-clear pool or play a lively game of fetch with your pet at our dog park. Here's a handy guide to making oven cleaning (mostly) hassle-free. After all, no one will ever see the inside of your oven but you, right? The truth is that a clean oven is more than just a matter of appearance. Caked-on food and grease continues to cook each time your oven is turned on, creating hazards of fire and stinky smoke. Those carbon-loaded fumes can add an unpleasant taste to even the most mouth-watering cakes, pies and other baked goods. Crusty build-up extends baking and cooking times. See this for yourself by using an oven thermometer and comparing the actual temperature to the setting. Can Oven Cleaning Be Eco-Friendly? Not only can it be, it should be. 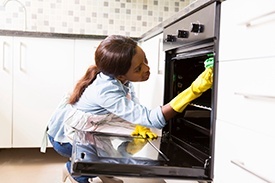 Commercial oven cleaners are some of the most chemical-laden products you'll find on store shelves, and the odor lingers long after the job is done. You should be particularly concerned with using safe products if you have kids or pets in your household. For light cleaning, put citrus peels in a pan and cover them with water. Place the pan in the oven and set it to 350°F for about 20 to 25 minutes. Once the oven has cooled sufficiently, use a sponge to wipe away debris. Make a thick paste from baking soda, coarse salt and liquid dish soap. Apply to oven walls and let it sit for several hours, preferably overnight, then rinse with clean warm water. Sprinkle baking soda liberally around the oven, then use a spray bottle filled with vinegar to moisten it. Leave it overnight before wiping the oven clean with a damp sponge. Have some stainless-steel pads or a pumice stone on hand to tackle those extra-tough build-ups. Also, even though these solutions are natural, always wear rubber gloves when applying them to prevent skin irritation. Once your stove is sparkling clean, keep grime to a minimum by wiping it down with a vinegar-soaked sponge or cloth once a week. You can also prevent baked-on spills by placing a piece of aluminum foil on the lower rack (but NOT on the bottom) when baking or cooking. With a little TLC, you and your oven will share a long and happy relationship.